When the Winter Olympics opens in Vancouver in mid-February, three athletes with Cornell ties will be among those vying for coveted gold medals. Hockey players Douglas Murray '03 and Rebecca Johnston '12 and bobsled team member Jamie Moriarty '03 will help carry the hopes for their respective countries while also representing the Big Red of Cornell. 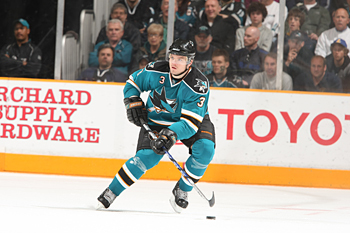 Douglas Murray '03, currently a defenseman for the San Jose Sharks of the National Hockey League, will play for his native Sweden at the Olympic Games. Murray, a defenseman at Cornell from 1999 through 2003, is currently a defenseman for the San Jose Sharks of the National Hockey League and will play for his native Sweden at the Olympic Games. Murray becomes just the fifth Cornell men's hockey player to compete in the Olympics and the first to compete for a country other than Canada. Other Cornell hockey players who competed in the Olympics are Darren Eliot (1984), Kent Manderville and Dan Ratushny (1992) and Joe Nieuwendyk (1998 and 2002). Manderville and Ratushny both won silver medals with Team Canada in 1992, while Nieuwendyk claimed gold with Canada in 2002 in Salt Lake City. Johnston, meanwhile, becomes just the second Cornell women's hockey player to compete in the Olympics, joining Dana Antal, who played in the 2002 in Salt Lake City, winning a gold medal with Team Canada. Like Antal, Johnston will represent her native Canada and has expressed a great deal of excitement about competing in the Olympics in her home country. Rebecca Johnston '12 will become just the second Cornell women's hockey player to compete in the Olympics when she joins Team Canada in February in Vancouver. "I was so excited, I just shook the coaches' hands and I didn't know what to say," Johnston told the Sudbury Star, her hometown newspaper in Ontario, after learning she was chosen for the team. Both players have a realistic chance at winning gold in Vancouver. Canada's women's team is one of the strongest in the world, having won gold at both the 2002 and 2006 Winter Olympics. Canada has also finished either first or second at the World Championships in each of the dozen times the tournament has been contested. Sweden, meanwhile, is also the defending Olympic champion after winning gold in Turin, Italy, in 2006. All but four of Sweden's players play professionally in the NHL. Johnston and the Canadian women will open up the eight-team tournament Feb. 13 against Slovakia. Also included in Canada's group are Sweden and Switzerland. The women's gold medal game will be played Feb. 25. 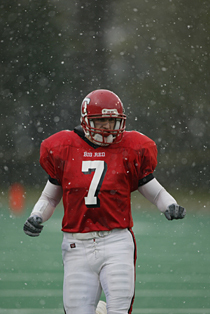 Jamie Moriarty '03, shown here during his Cornell football days, is part of the U.S. Olympic bobsled team. In the men's tournament, a 12-team field awaits, with Sweden grouped with Germany, Belarus and Finland. The Swedes will take on Germany in their tournament opener Feb. 17, while the tournament concludes with the gold medal match Feb. 28. Away from the rink, one more former Big Red athlete will have a chance to shine, as Moriarty, a former Cornell football player, will represent the United States as a member of the U.S. Olympic bobsled team. A three-year letter winner for the Big Red on the gridiron, Moriarty comes from a long line of exceptional athletes: His father was a member of the NFL's Cleveland Browns, in addition to putting in stints with the Atlanta Falcons and Pittsburgh Steelers, while his three uncles, Frank, Pat and Larry, played for the Denver Broncos, Cleveland Browns and Houston Oilers, respectively. Moriarty finished his Cornell career with 152 tackles and six interceptions as a defensive back. He will be in the four-man USA III sled along with teammates Nick Cunningham, Bill Schuffenhauer and Mike Kohn. Kevin Zeise is assistant director of athletic communications.